A full-service companion animal hospital serving the greater Portland area for over 20 years! 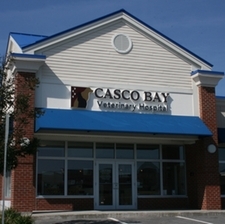 At Casco Bay Veterinary Hospital we are committed to providing genuine care, comfort, and high quality veterinary medicine for our patients and clients. We are committed to nurturing the human-animal bond and helping pets live healthier, longer lives. We pledge to provide the best client service at all times. We promise to treat you and your pets with honesty, respect, and dignity, the Casco Bay way.